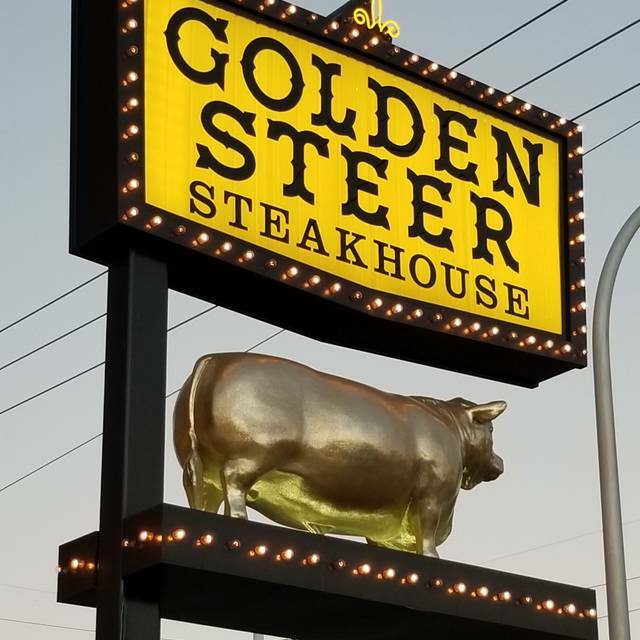 You must make reservations at least 5 minutes in advance of the time at Golden Steer Steakhouse. for 60 years and conveniently located just off the Strip. 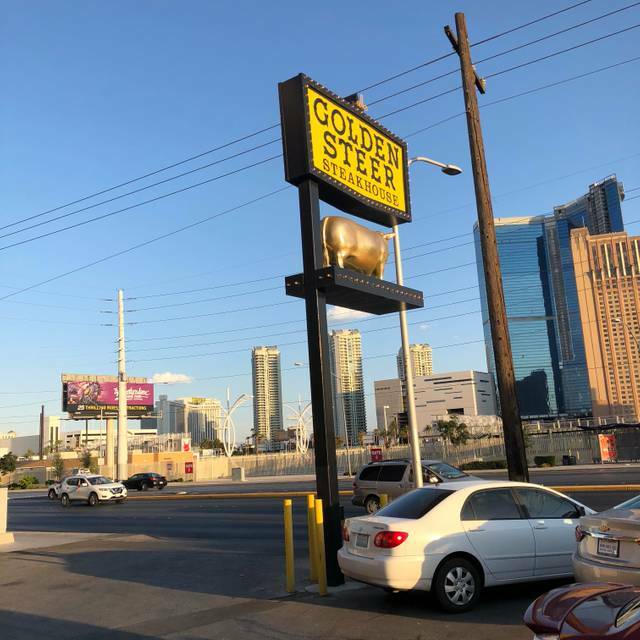 The Golden Steer Steakhouse is the oldest Steakhouse in Las Vegas, Est. 1958, also earning us our trademark: "The Best Steaks On Earth"
Fantastic experience! Waitstaff was amazing. Happy to celebrate there. 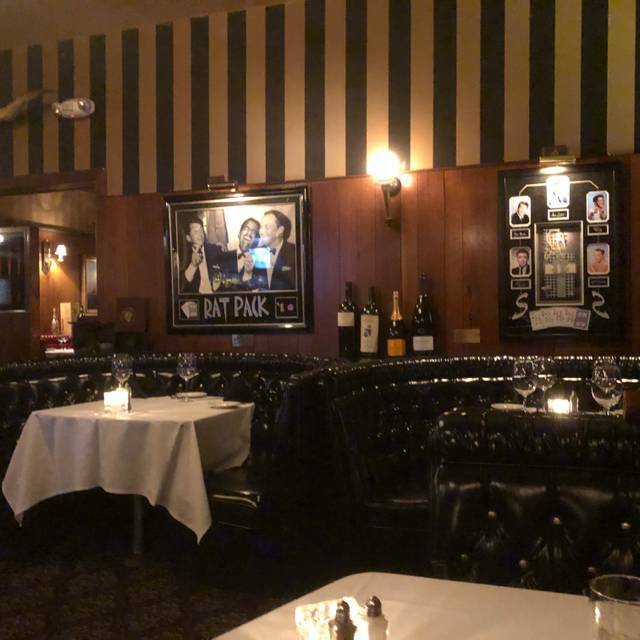 Great meal in a classic old school steakhouse setting. Waiter was weird and not attentive. Done eating 40 minutes before the bill came. And another 20 before he took it. Best steak I ever had. Loved it. Excellent place for an anniversary or special occasions. Very expensive but worth it if your prepared for that. Also had the escargot and oysters -all was yum! Excellent service, food quality and ambiance. 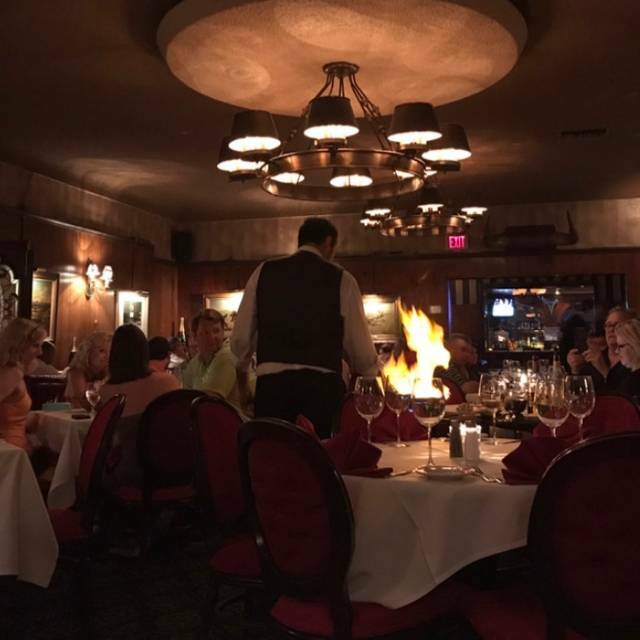 Old world, Vegas Steakhouse with red leather booths, tuxedo’d maitre d’, and attentive staff. Fantastic experience! Highly recommend. Worth the cab ride from The Strip. All staff were friendly and welcoming. Ordered the Caesar salad which is made table side by an expert! Delicious and an experience not to miss. We had filet excellent quality. They were happy to call a cab for us when we were ready to leave & all those that had served us came out to bid us farewell. A wonderful experience! Will definitely dine there on our next trip to Vegas! Well done! Our meals were out of this world. I would highly recommend this restaurant!!! The food was top shelf and the service was beyond reproach. We will be back! My birthday visit to the GS was ruined by a huge party of loud and obnoxious guests... about 40 or so, who shouted and whistled, talked at the top of their lungs, and were apparently oblivious to the way they were wrecking everyone else’s evening. The staff and management clearly did not care about how everyone else’s night was being ruined, since they stood to gain a lot of $$ from the group of guys who acted like they were in a high school locker room. We couldn’t even hear ourselves talk at our table. Management was advised and didn’t do a single thing to quiet the group down. I have been coming here for over 20 years. Based on what happened, I will NEVER be back again. I wrote a full review on YELP! For anyone who wants to read all the gory details. Horrible night. Went for my anniversary and asked for a private seating. On arrival was not greeted appropriately and was sat in a loud non private seat when it is advertised on the website that if requested will accommodate for free. Also states on the website it is upscale, service wasn't upscale it was similar to a chain restaurant. The food was amazing and the place looked beautiful inside. Just wish the service was equal to the chefs food. Food was outstanding - especially the petit filet mignon, 22oz ribeye, tableside Caesar salad, twice baked potato, and strawberry cheesecake! The dining room has great character and I’d recommend this establishment. excellent setting - old LV, great food. I checked it out online before I made the reservation - the experience is better than what I found on line. Old Vegas done timelessly. This is what steak should be. Filet was great, prime rib was terrible and dry. Dessert was great! get rid of the slots at the bar make it a bar slash restaurant there is enough slots on the strip for everyone. great restaurant great food and killer history. This is not the same great restaurant that is was. I've been going for about fifteen years and the service has dropped off in the last three to five years. We've given them the benefit of the doubt, but fool me once, shame on you. Fool me two and three times, not going back. The wait staff has gone from experienced, career servers, to slightly abrasive, and unable to cope. On the plus side, my steak, filet, was delicious. But while ordering, one of our group asked specifically if the baked potatoes would come out hot. Our server was incredulous, and said "of course." They weren't. Not even hot enough to melt the butter. When it was brought to his attention at the end of the meal (he never checked back during the meal), instead of an apology, he said "why didn't you say something." He also became defensive when we did not opt for his recommendation for dessert. And maybe this is just a coincidence, but the diner in our group that questioned the potatoes, also had an fraudulent charge attempted on their credit card later that night. Plenty of great options in Vegas to have to put up with this. Top-notch example of an old-school Vegas steakhouse with amazing service and great food, wine and cocktails. This was really fun AND delicious; highly recommend. THIS WAS THE WORST EXPERIENCE I HAVE EVER HAD IN A RESTAURANT. THE MANAGEMENT IS RUDE. A TOURIST TRAP. I WILL GO OUT OF MY WAY TO TELL EVERYONE I KNOW TO NEVER DARKEN THEIR DOOR. i SUGGEST YOU REMOVE THEM FROM OPEN TABLE. We are open to and welcome constructive feedback to ways that we can improve our dining experience. However, the manner in which feedback is provided must be with respect for our staff as people. Your shouting and yelling at multiple staff members is inexcusable. During a busy convention, we sat your incomplete party and you waited 1 hour before ordering. You then stayed almost 20 minutes beyond the time you agreed to when we sat you. The food and atmosphere lived up to what i expected. It was old school Las Vegas. They had the food down to perfection. I get the steak as it is a steak house but I could have easily gone with some of the Italian dinners. Top it off with some great stories that the waiter told us of the old days and the evening was complete. Excellent food, great service highly recommend!! Definitely will be back! If you enjoy old school prime steak. Caesar salad table side with the original recipe. Away from the strip. This is the place for you. John the bartender seemed like a crabby one. LeAnn was sparkly, talkative & engaging. Seems John didn't have time for tourists. The wait staff was excellent, although my filet l was under done & waiter didn't ask if my steak was properly cooked. All in all, a decent experience with good food. Thank you for keeping an old steakhouse alive! 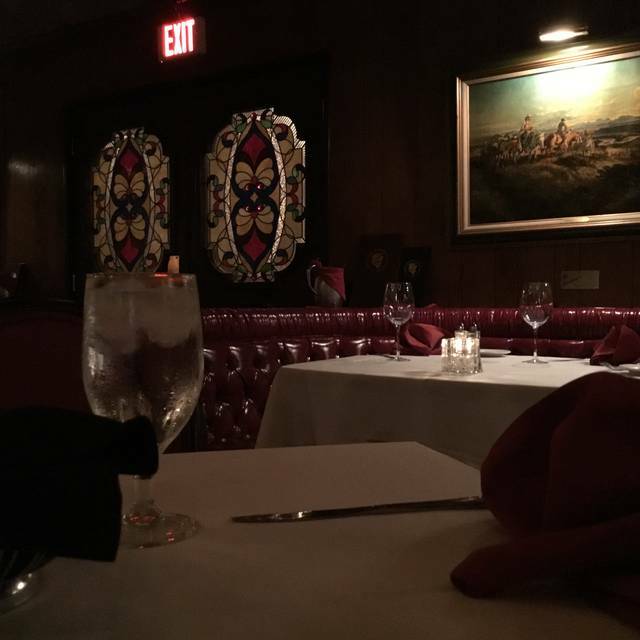 Loved the ambiance of this old school Vegas steakhouse. The ceasar salad was great, made at table side and the stuffed mushrooms were very good. Sadly the steaks were not first rate. They were a little tough and fatty. They were cooked properly, but overall the steaks were good not great. This restaurant is a Vegas must! It's off the beaten path and in an unassuming strip center, but boy, what a great place! 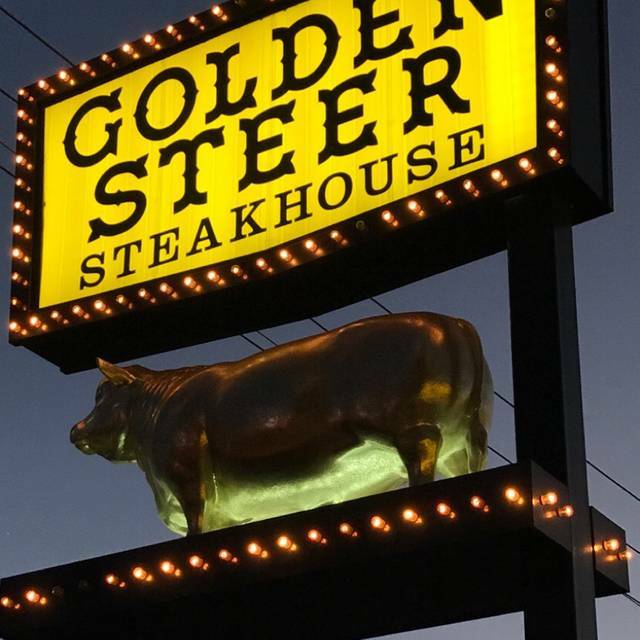 We were looking for a good steakhouse, not a chain restaurant, and found reviews for the Golden Steer and decided to try it. 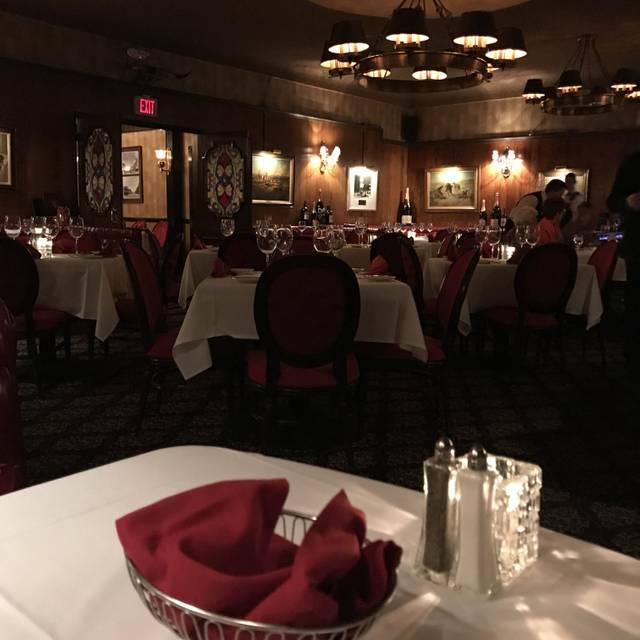 It's the oldest LV steakhouse with tons of local history and the ambiance is great - red leather booths and low lighting. We sat in Betty Grables's booth. We ordered their table side Caesar Salad which was delicious and the 22 oz bone in ribeye to share. The steak was one of the best we've had. The service was excellent. You cannot go wrong with this steakhouse. Was a wonderful experience. Hands down the best steak I have ever ate!! Sat in Dean Martin’s booth. Really enjoyed, top rated service. 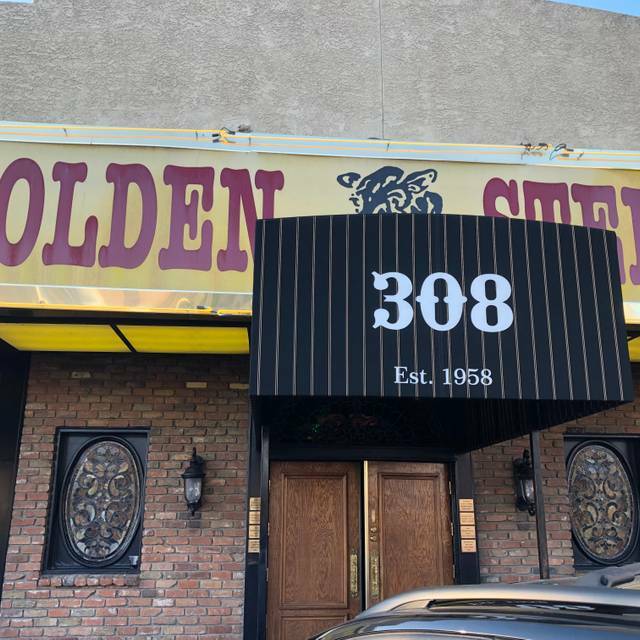 The Golden Steer is a must go to when visiting Las Vegas if you are a steak and or seafood lover. On this visit we started off with greetings by our 3 servers. Venko is the only name I truly remember as he came to the table to make us Caesar salads and for dessert cherries jubilee. After watching him create the salad at the table I thought to myself I'll never buy bottled Caesar dressing again but my attempt didn't turn out nearly as good. In addition to the salad and dessert we also enjoyed the French Onion Soup which is not lacking on cheese or the crouton on top. It has an incredibly rich broth and lots of onions to satisfy. The Oysters Rockefeller were incredible and presented beautifully. Our main entrée was petite filet mignon with a trio of sauces. I'm not sure I've ever had better béarnaise anywhere else. All in all, this is a well worth trip just slightly off the strip on Sahara. And if you need a place for a group dinner, they have 2 private dining rooms. The food was amazing. Make sure to get the Cesar salad!! All of our steaks were cooked perfect. Can't wait to go back. My parents went there for my mom's 66th birthday. The service was wonderful. We had Carlos as our waiter. He was generous and attentive and the food was excellent. Thank you for making a very special memory for my mom and dad. It was our first time. The atmosphere was awesome and the history was enticing. The Steak was just as awesome; it was so good I didn't need to add A1 on it. The service and food were Great. We loved it and all of the history of all of the famous people that use to eat there. A Vegas classic! Such an amazing steakhouse...60 years old! We sat in Dean Martin's booth...pretty cool.